The APP PGR course offers initial teacher education, situated in the HE context. It comprises face-to-face taught sessions, online activities and an e-portfolio of reflective practice and summative work. In addition, participants will complete two teaching observations. The four core workshop sessions are run in a sequence, with participants choosing their preferred 'route' (3 options across the academic year) to fit the programme effectively around their studies. Core workshops have set themes, covering key concepts in higher education pedagogy, including small and large group teaching techniques, assessment and inclusive practice. Core workshops will not only cover key concepts, but model a range of teaching methodologies, including the use of classroom technologies. Click here to see the themes for each workshop and their relationship to the UK PSF. In addition, participants will complete 3 CPD workshops, from a broad menu of options, enabling them to tailor their development around their interests. CPD workshops are delivered by a range of expert teaching staff from across the University. As well as workshop attendance, participants will complete a number of online tasks related to the course themes and workshop content. Some of these will be collaborative with peers in the route, whilst others will be individual reflections or contributions to the personal e-portfolio. Participants will be encouraged to reflect upon the workshops and their themes in relation to their own practice and learning and to consider this development in the context of the UKPSF, through an e-portfolio journal. Click here to find out more about e-Portfolios at Warwick. Reflective practice is a key tenet of teacher development and participants will learn how to think and write reflectively, if they have not done this kind of work before. To meet the criteria to be awarded the status of Associate Fellow, participants will also carry out two teaching observations, create a teaching philosophy statement (500 words) and a final narrative of professional practice (1400 words), which draws together their learning and experiences in relation to the UKPSF and course content. Participants will be fully guided on these aspects of assessment and given the opportunity to develop them right from the start of the first workshop. 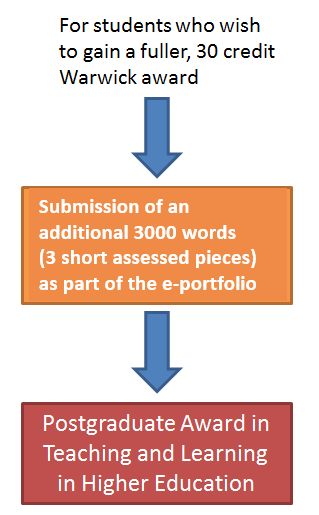 Finally, for those participants wishing to gain University credit (30 credits at Masters level) there is the opportunity to broaden the e-portfolio of work (additional 3000 words) which leads to a Postgraduate Award qualification. Participants will enrol formally for this qualification and the usual postgraduate course assessment and regulations will apply.